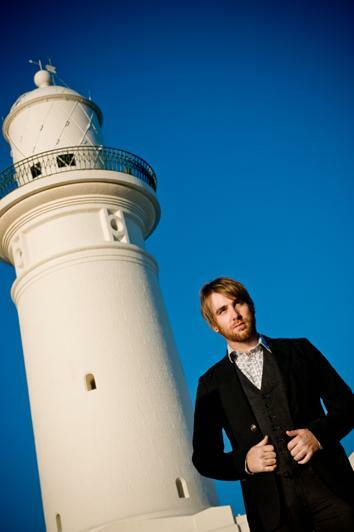 We last caught up with Sydney’s Josh Pyke when he was piloting a large acoustic guitar on the city’s famous harbour. The guitar boat now sold, with proceeds going straight to the Indigenous Literary Project, focus now turns to Josh’s new single – the rather aptly titled ‘The Summer’ – even though we’ve now officially entered Autumn. As the singer prepares to complete his Aussie tour and head to the United States and Europe for a series of live shows, let’s have a gander at the new clip, which reportedly features a guest cameo appearance by an Australian cult television icon. Man wakes up – it’s clearly been a warm and restless night’s sleep – he’s been sleeping with fan aimed squarely at his bed all eve, he wanders into the kitchen, has some brekky and then breaks out the masking tape, wrapping it around his wrists. We wonder why, but we keep watching and by clip’s end, we feel a little foolish for completely misunderstanding the term ‘featuring the sandman’. It would appear the man featured in this clip takes the motto ‘life’s a beach’ a little too seriously.